Do you want to get a custom logo for your WordPress website? A custom logo helps establish your brand and makes your website stand out. In this article, we will show you some of the best places to get a custom logo for your website within a small budget. Why You Should Get a Custom Logo? Logos are the representative images used by businesses and organizations. They depict a visual representation of an organization’s business, values, and mission. They also play an important role in how customers see a brand. Look at the top big name brands, chances are that you can recognize most of their logos quite easily. Brand recognition helps you win customer trust and loyalty overtime. Most WordPress themes come with the option to upload custom logo. This logo can also be used as site icon or favicon. Now the problem is that not all of us are graphic designers. You can try to create a custom logo by using an image editing programs, but it may not look professional. If you want a professional image for your brand, then it helps to hire someone to create your custom logo for your website. That being said, let’s take a look at some of the best places to get a custom WordPress logo within budget. 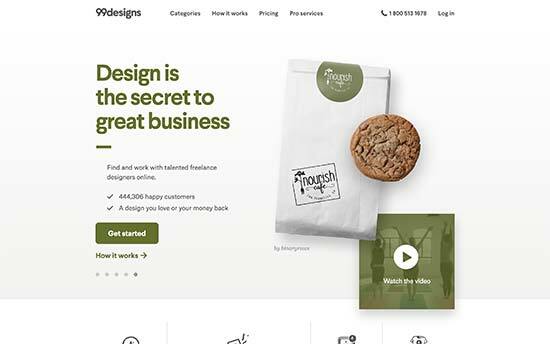 99designs is a design contest marketplace with a large community of designers. It acts as a middleman between you and designers. When you place an order, 99designs outsources it to designers who then submit their designs. You can select the design you like the most and only that designer gets paid. This gives you advantage of getting different custom logo ideas from designers of different backgrounds and skill levels. Want to create your own custom logo? Logojoy is an easy to use, DIY, logo maker for non-designers. 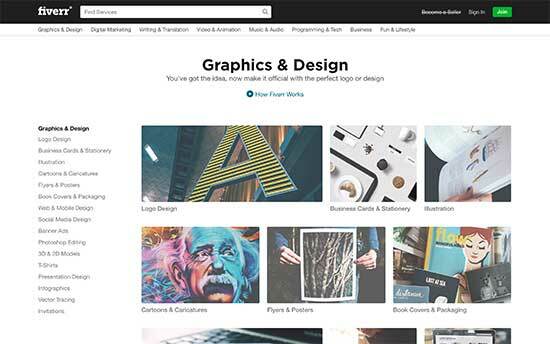 Unlike other web based graphic design tools, Logojoy uses artificial intelligence and advanced learning algorithms to create logos just like a designer would do. Logojoy’s simple wizard helps you choose your own colors, images, and words to describe your business. After that it generates designs that look well crafted and professional. Their pricing plans start as low as $20 for a low resolution logo. Higher pricing plans get you high-resolution files, phone support, color palette, brand guidelines, and more. Dribble is an online community of designers and artists. Think of it as Pinterest for professional graphic designers, artists, and illustrators where they share their works and other users can like, favorite, and reshare it. Dribble is not just a source for inspiration. 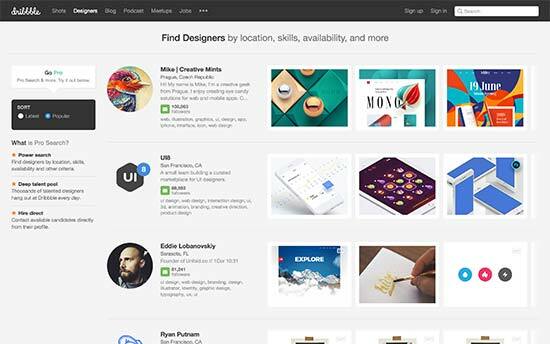 It also acts as a platform to hire designers for freelance work. You can browse designers, check out their portfolios, and contact them directly to hire them. The cost of a job will actually depend on the freelancer you approach, their expertise and skill level. Dribble may not be the place to find the cheapest custom logo for your website, but it can help you get much better quality. 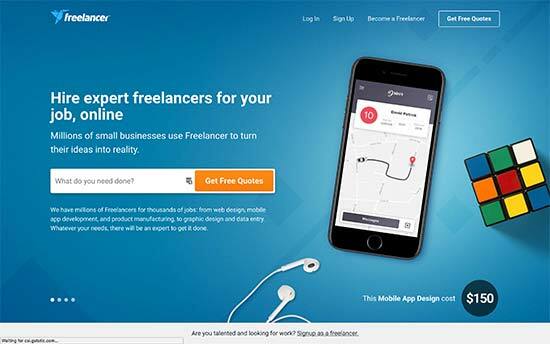 Fiverr is one of the largest online community of freelancers from all over the world. Due to competition among freelancers, you can hire a designer to create a logo design for a lot less money than other places. Fiverr’s community is organized based on the customer feedback. Freelancers with higher positive feedback tend to charge more than new freelancers who don’t have enough reviews yet. While the logo may only cost a few bucks, its important to know that often these freelancers are using logo templates with minor tweaks. 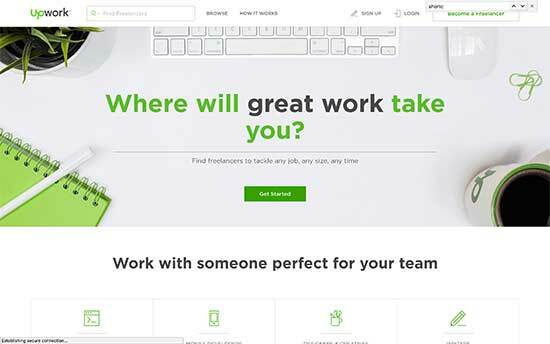 Similar to Fiverr, Upwork is an online community of freelancers, entrepreneurs, and designers. It allows you to post a job and accept offers from freelancers. You can then review those freelancers, interview them, and hire the one you want to work with. Upwork has a robust community with screening tools for both freelancers and clients. Freelancers can participate in online tests to prove their proficiency and skills. Upwork also offers various payment methods, invoices, and allows clients to only pay for the work they approve. 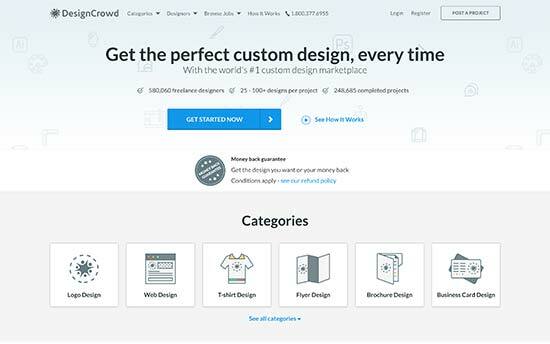 DesignCrowd is a design contest marketplace and an online community of designers. You can start a project by filling in the project brief, selecting your logo design type, and providing a detailed description for the designers to follow. Next, you’ll pay the contest posting fee and deposit your budget with DesignCrowd. They offer a money back guarantee, which allows you to ask for a refund within 30 days of posting your project. Once you like a custom logo design, you can commit a budget. Freelancer is a large global community of freelancers. You can find web designers, developers, graphic design, audio/video, online marketing experts from every corner of the planet with varying skills levels. Like many other freelancing websites, Freelancer allows you to post your custom logo project as a job and start accepting offers from freelancers. You can review freelancer profiles, past jobs, feedback and ratings. Once you find the right freelancer, you can hire them. Upon completion of project, you’ll be able to review and accept the work and release the payment. 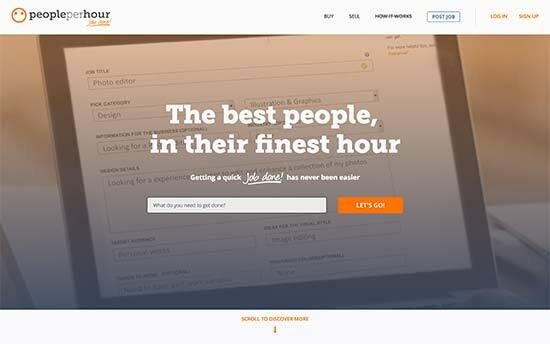 PeoplePerHour is a curated community of freelancers and professionals. You can browse hourlies (fixed price jobs), post a job, or run a contest. You can also browse freelancers by categories, view their profiles, and portfolios. Once you post a job, you’ll get access to your Workstream dashboard. This is where you’ll manage and review the work, communicate with freelancers, and get support from PeoplePerHour staff. Once you are satisfied with the logo design, you can release the payment to the freelancer. We hope this article helped you find the best places to get a custom logo for your website. You may also want to see our article on best examples of contact form page design. Awesome! Thank you for such an informative article. Good resources for designing brand logo. Thanks for sharing.